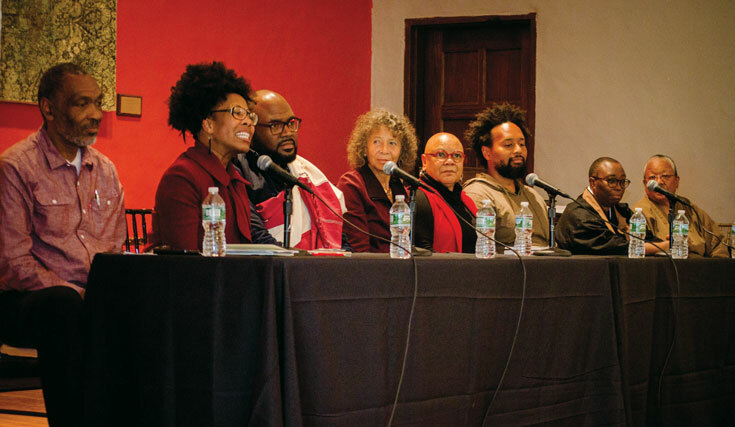 At the first-ever gathering of Buddhist teachers of black African descent, held at New York’s Union Theological Seminary, two panels of leading Buddhist teachers took questions about what it means to be a black Buddhist in America today. From the March 2019 issue of Lion’s Roar. Photos by Garlia Cornelius. 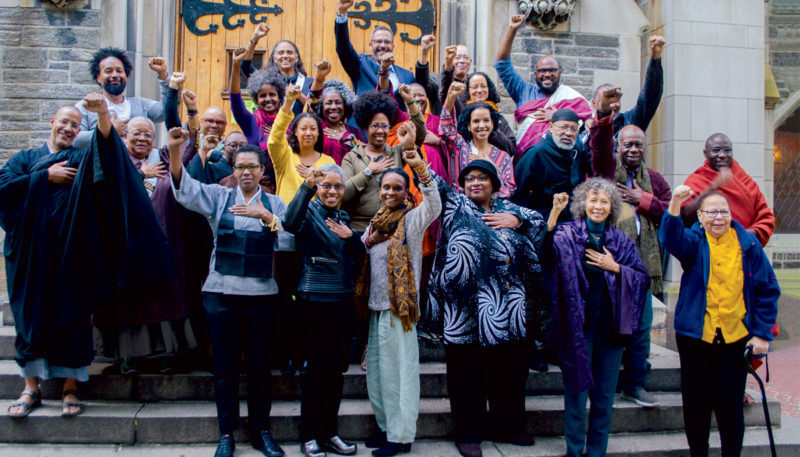 Strength, love, and unity at the first-ever gathering of Buddhist teachers of black African descent. Question: Why was it important for you as black Buddhists to come together? Ruth King: Until we come together as a group of black folks, we don’t actually realize what we’ve been missing. It’s like there’s a certain hunger you can’t touch until you’re in the soup together. It’s a beautiful surrender, a beautiful uplifting, and a beautiful reminder that the dharma is deeper than a lot of the Buddhist institutions we find ourselves in. There’s tremendous liberation in our connectedness, in remembering who we are and the lineages that we’ve come from that run parallel to the dharma. Coming together at this gathering, there’s been a tremendous sense of spiritual wealth. It’s a deep stream that has been nourishing and refreshing, and it has fortified us to do what must be done in our communities. Chimyo Atkinson: We need to understand that dharma centers suffer from the same thread of racism that all the organizations in our society suffer from. This is not necessarily the problem of the black practitioner. I’ve been very fortunate to have found a welcoming dharma family where I practice, and I’m very grateful for that. But I also recognize that the insidious stream of this disease plagues us even there. I’m the only black person in that room and I’m a teacher. What does that mean? Coming here to sit with other teachers who have some of the same experiences and background that I do is very precious and nurturing for me. It informs me. It lets me see my blind spots and how I can help others. And by others, I mean all other sentient beings, whatever color their bodies are. Lama Rod Owens: Representation is very important. I’m tired of this mythology that black people don’t practice Buddhism. (This is for my family, if you’re watching.) Gathering together and having this documented is proof for all the Buddhist teachers who say there aren’t any black people in their tradition who practice. For me personally, I came up in my tradition with no idea that there were black people in Vajrayana Buddhism. The first black teacher I met was me. Myokei Caine-Barrett, Shonin: Many of us find ourselves in spaces where we’re not allowed to talk about the suffering of racism. It is a disease that infects all of us, especially in America, and if we don’t talk about it, we’ll never get rid of it. Coming together allows us to talk about it, to share our wounds, to heal each other, and to acknowledge the pain and the loss we all suffer when we are separated. Gretchen Rohr: There’s an opening that occurs in spaces where we are within our own affinity groups. When in spaces with other people of color, there are a lot of different forms in which our liberation can express itself. It’s hard to dive into the unique shapes in the black community when we’re not among other black practitioners and teachers. It gives us an opportunity to hold ourselves more accountable about some of the stuff we may not get to when we are in multiracial spaces. Jozen Tamori Gibson: Ancestry is very important for me. Honoring elderhood is very important for me—understanding what it means to be invited to hold and carry a torch, understanding what that torch feels like when it’s passed hand to hand, heart to heart. It has been very important for me to feel that in this physical space. Question: As someone who has been an artist–activist all my adult life, my question is: What does engaged Buddhism look like? What is Buddhism’s role in social justice and in the political process? Gina Sharpe: Sometimes we may think that a Buddhist life comes through the mind. But actually it involves the mind, the body, and the heart. It’s not just what we think. That’s important, but it’s not 100 percent of our practice. For me, activism means manifesting these beautiful teachings that I have been given. I am sharing that gift with my body, with my mind, and with my heart. Activism is not separate from who I am as a practicing Buddhist; it is inextricably connected. If we have compassion and peace, it’s natural to want to help the world live in justice and peace. In some ways, we don’t even have to add the word “Buddhist.” We’re just good people wanting the world to reflect what we feel inside. We’re not limited to our own liberation. Liberation is impossible if we’re disconnected from others. Ruth King: For me, so much of Buddhist practice is about a deep understanding of our interdependence. Every action I take plants a seed. When I’m doing my artistry and my activism, I ask myself: Can I be in this fight while holding somebody’s hand? Can I tell you how I really feel, but also maintain a sense of respect and humanity? Can I do that with sensitivity and care, while still saying what needs to be said and doing what needs to be done? It’s a crazy time right now, so what we do is important. It’s important to keep doing our work of activism. Our artistry is important as cultural medicine. It’s important how we go about it. We’re planting seeds all the time. Gretchen Rohr: I see activism as an engagement with my aligned values. A practice of mindfulness is mindless if it’s not driven by a value system. I’m very inspired by the work of some of the people and organizations I support. I’m honored to serve on the board of the Buddhist Peace Fellowship, which has a program called Build Block Be: build the good stuff, block the bad stuff, and be in alignment with your Buddhist values. That’s what it is for me. Ralph Steele, Gretchen Rohr, Lama Rod Owens, Gina Sharpe, Ruth King, Jozen Tamori Gibson, Chimyo Atkinson, Myokei Caine-Barrett. Question: What challenges have you faced as people of color in your Buddhist tradition and how do you overcome those challenges? For me, it’s been a long, lonely journey. Ralph Steele: It has been lonely for me too. When I see you, I see me. As a kid, I saw races separated by signs that said “For coloreds only.” I saw race riots, I lost a lot of friends in Vietnam, and I went through the epidemic of drugs and so forth. At a certain point, though, the practice begins to teach you how to let go and let things be. But you have to practice. After you reach ten thousand hours of practice you begin to let things be, and when you go over ten thousand hours of practice…yeah, now you’re smiling. The Buddhist practice is not passive. It’s very seriously active. Ruth King: The question is a brave one. It’s a question that asks how we cope when our practice is hard and when there’s a lot of struggle around race and racism in the institutions we’re in. What I can say to you, from our journey this weekend, is that we’re all playing with some variation of that. The intention is to bring the wisdom of Buddhist teachings into the heart of the struggle, and that is indeed a practice. I want you to know that you’re not alone in this exploration. It’s not like we ever finally arrive. We are constantly arriving and humbling ourselves and tenderizing our hearts around what it means to walk in the world with an open heart. Chimyo Atkinson: The loneliness is very much a part of my life too. Practicing dharma looks lonely because you’re sitting on a cushion all by yourself. But we sometimes forget that one of the triple jewels of Buddhism is sangha, community. You can begin dharma practice on your own—you can begin it anywhere, even right now sitting right there—but it’s very important to find other people you can practice with. It’s going to take some effort. I don’t like to call it shopping around, but sometimes you know what fits when you walk in the room, and other times, you have to give people a chance. Sometimes you have to take what you can get and make your connections there. It’s an effort on both sides. Do not give up. We’re sitting here, come find us. This interconnection of all beings is real. Question: Many of our Buddhist communities are still white-dominated. Sometimes as people of color we get invitations to participate in the decision-making, but the change of pace can be pretty glacial. Do we continue pushing from within when we get invited to have a seat at the table, or is there a way for change to happen at a slightly more revolutionary pace? Gina Sharpe: The answer is yes and yes. There are many pathways to diversity. I think that there are ways to work within certain institutions, but it is glacial. It’s always been glacial. Just because these are Buddhist spaces, we think somehow that people should be sincere, receptive, and transparent. But we’re complicated beings, and although we may have the best of intentions, we are deeply conditioned by a racist society. Our resistance to deracializing the mind is high, because we’re humans. We love our conditioned minds because we’ve been living with them for a very long time and we’re familiar with them. An extraordinary amount of patience is necessary. Sometimes we need to figure out ways to be creative and listen deeply to what is needed, without reference to the larger society. Learn through your own love, compassion, and kindness. Create your own pathways to change. They’re there, but they have to be excavated. So as a short answer: yes, it’s frustrating to work from within, but it’s necessary. It’s also necessary to find our own ways of working so that we can create spaces like what we have created in this room, in which we actually work together and envision another way of being in this society. Ruth King: Sometimes we have to intervene and sometimes we have to pass and care for ourselves. Sometimes we intervene at the individual level in our relationships. Sometimes we intervene at the group level and we find people like ourselves. Sometimes we intervene at the institutional level. But we can’t intervene in all of it all the time. There needs to be some choicefulness around how we respond to the wackiness that’s in the world. Question: I’m a liberation feminist theologian. My Christian liberation theology teachers say you have to take a side, because if you’re silent in the midst of a conflict and struggle, you’re supporting the oppressor. On the other hand, Buddhism teaches the principle of nonduality, which some Buddhist teachers say means that you shouldn’t take sides. How do we work with the fact that at the ultimate level there’s nonduality, but on the relative level there’s white supremacy and all the other injustices of the world? Dr. Kamilah Majied: In terms of whether or not we choose sides, I think about something Dr. King said: “The question is not whether we will be extremists, but what kind of extremists will we be? 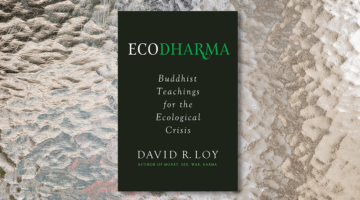 Will we be extremists for hate or for love?” When Shakyamuni Buddha said, “My desire and my vow is to make all beings equal to me,” he was talking about the vow to make all beings equal in enlightenment. When we juxtapose those truths, we can confidently trust the wisdom that emerges from our practice to guide us to handle all sides of a conflict with wisdom and love. The aspiration is not to be equal in pettiness, competitiveness, or partisanship. We desire to be equal in having an enlightened experience of reality that allows us to see all sides and act with wisdom for the good of the whole. We need our practice of Buddhism to figure out how to wisely engage in situations where there’s conflict. One of the first things I chanted about as a Buddhist was the racism I encountered in 1982 when a professor told me that Shakespeare, Chaucer, and Milton were the only classic authors I could write about. 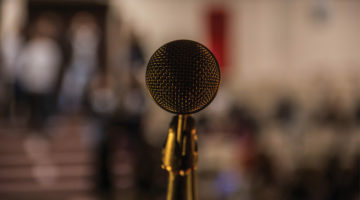 A Buddhist leader told me to chant about it, and it was through my practice that wisdom arose in terms of how I could handle and change that situation. Rev. angel Kyodo williams: Take sides, but also take care. I don’t think taking sides suggests that we negate the humanity of everyone else’s position. We take sides and we understand that we must take care of the whole. We find our wholeness in our firm and clear locating of ourselves on the side of love. In locating ourselves on the side of love, we become more whole. It’s a yes, rather than a no. Taking sides is a yes to love, rather than a no to you. You definitely take sides. I agree 100 percent. What I always think about is what’s going to cause the least amount of harm. If something is causing harm, that’s not okay. The container of equanimity is holding it all in the “we” space. What is best for “we”? Finding that “we” space is really important. You don’t put anybody out of your heart, but you also say no firmly. Ven. Dr. Pannavati: We have to decide whether we want to just fight or fight the good fight. The Buddha said that hatred is never overcome by hatred. If hatred is what’s motivating and propelling me, I’m not able to fight the good fight. Then I have to step back and deal with what is rising up in me. When that’s taken care of, then I’m qualified to fight the good fight. Some people want to do a good thing, but they haven’t taken the route of discipline to subdue their own demons. So their action carries the energy of where they are. It’s incumbent upon us to find out where we are. Count up the cost before you go into battle. If you can’t handle it, don’t go. But if you can, then go. Don’t necessarily expect that you’re going to see the fruit of that. You may never see it in your lifetime. Does that make a difference to what you do? Some of us are stepping forward and initiating things that we will never see the fruit of. But we know that we planted the right seed and gave it the right energy, and in its due season it is going to bear fruit. That’s how we have to go into every struggle, particularly in a time like this when there is no stability to be found anywhere. The only stability is what I take with me. We turn our practice back to ourselves continually, and we get an idea of what we can do that will be fervent and yet effective. Rev. angel Kyodo williams: I think one of the unique things that black folks bring to the dharma is that we can’t afford not to take sides. It’s privilege that allows people to say, “We’re going to have a dharma that’s about not taking sides.” I think colored folks and black folks really bring forth the truth that we can’t afford not to be the dharma that is expressed through these bodies. If dharma is going to be authentic through our bodies, we can’t sit in the location of not taking sides. Pamela Ayo Yetunde: The Christian liberation theologian James Cone said God is black and Jesus is black. Thich Nhat Hanh is black in this respect. In this respect, during the Vietnam War all Vietnamese were black. Thich Nhat Hanh has taken sides many times. He takes the side of compassion. He takes the side of wisdom. He takes the side of nonaggression. He chose to come from Vietnam to the United States to transform our ways of aggression to save his people. He was taking a side to be here to make that change. That’s what we have to do. Dawa Tarchin Phillips: That is a great question, which deserves a longer answer. If you’re just looking to confirm what you’re already thinking about people and the world, the Buddha’s teachings might not be the right place for you. It’s the job of the Buddha’s teachings to challenge assumptions and show you that you have a limited perspective if you think you’re the only one in the right. In breaking down prejudices it leads people to discover that we are all more alike than different, which is the birthplace of true humanity. When you are just taking a side, that can be used and abused by propaganda and mixed intentions. I think that “taking a stand” is an important and valuable alternative to “taking a side,” because taking a stand makes it clear that you want to see a specific positive change, like more truth, transparency, accountability, justice, equity, love, compassion, and discernment. People can rub themselves against your stand and really learn from your stand, and it isn’t so easily misused. 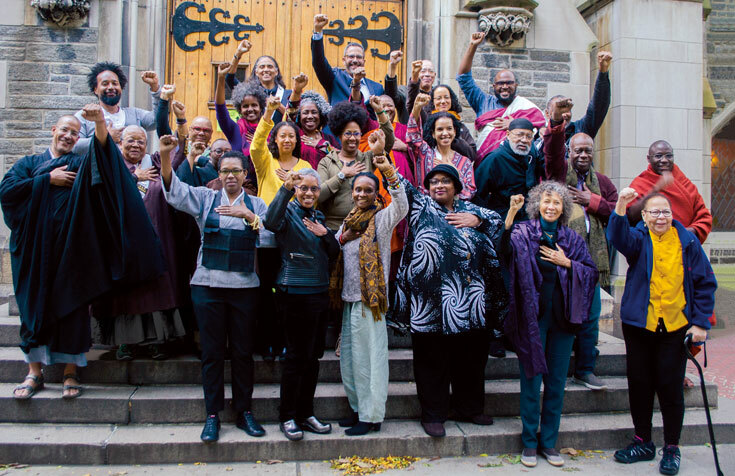 Twenty-nine leading teachers from across the country gathered in October for the first-ever meeting of black Buddhist teachers. The weekend was hosted by Lion’s Roar and Union Theological Seminary’s Thich Nhat Hanh Program for Engaged Buddhism, with support from the Hemera Foundation, the Arthur Vining Davis Foundations, and the Frederick P. Lenz Foundation. Question: Some of you have come to Buddhism from other religions. What is it about Buddhism that drew you to it? Myokei Caine-Barrett: I was raised as a Methodist and I had to go to church every Sunday. Every time I had a question, they couldn’t answer it. I was always told you just have to believe and when you believe you’ll figure it out. When I found Buddhism, I knew I had come home. Buddhism said it’s up to you, you are responsible, you take charge of your own life. Everything you need is within you; you just have to bring it out. That was heaven for me. I was raring to go and I never looked back. Konda Mason: Growing up black in America, I always heard about freedom and liberation. “You’re going to find freedom one day. Black people are going to find freedom.” That was in my head my whole life: freedom and liberation. I really enjoyed Baptist church, but I did not understand the path to liberation. I understand the path to liberation as the buddhadharma. I think of Buddhism as psychology more than religion, because it’s a step-by-step process. The Buddha said, “Don’t take my word for it, see if it works for you.” When I look at the basic teachings of the four noble truths, I see the steps. There’s a reason for suffering. It can change. This is how. The more I practice, the more I see that my liberation is right here, within myself. My lack of liberation is right here. There are a lot of things that can help in society, but my being trapped is inside myself. What mindfulness has done is show me where I’m tripping myself up. It shows me where I am telling myself all these stories and how I’m living a life that is sabotaging my own liberation. As I go deeper into the dharma, I see that path, I see that light, and I touch it. For me, it is a practical methodology and psychology that can liberate our heart and our mind. After that, it’s about co-liberation. It’s not just my liberation. It’s about our liberation. What I can see in myself, I can see in you. It’s a relational practice. enlightenment as absolute freedom resonated with me because I was someone who had always thought about liberation. As people of African heritage, I think we have a unique lens on liberation, and a unique lens on efforts to stifle our liberation. It was a very natural process to begin practicing Buddhism and recognizing that the first place to be free is within ourselves, by decolonizing our minds and erasing racism from our self-concept and sense of possibility. That human revolution, that inner cleansing, made me see how much I was in charge. There was no one who was going to damn or bless me. I had to work it out. This life was going to be blessed or damned to the degree that I took action to enrich myself and the lives of those around me. We’re all so deeply connected as humans, and we do have the compassion and the capacity to alleviate each others’ suffering. Gwendolyn Brooks said, “We are each other’s harvest. We are each other’s business. We are each other’s magnitude and bond.” These insights into reality drive me in my practice, because every day I think, “What am I going to do today to actualize my enlightenment?” The vision is always to try to take my enlightened self forward into each day and encourage other people’s enlightened selves to emerge. Myokei Caine-Barrett is the head priest and guiding teacher of the Nichiren Buddhist Sangha of Texas in Houston. She has been active in prison ministry, and currently supports two sanghas and assorted individuals throughout the Texas prison system. She is also currently bishop of the Nichiren Shu Order of North America. Konda Mason is a teacher at Spirit Rock Meditation Center and cofounder of Impact Hub Oakland. Gretchen Rohr is founder of Justice in Balance, a restorative justice forum dedicated to reconciling communities impacted by violence. She serves as a magistrate judge at the D.C. Superior Court. Venerable Pannavati is cofounder of Embracing Simplicity Hermitage in Hendersonville, North Carolina. A Theravada nun, she has also received dharma transmission from Roshi Bernie Glassman of Zen Peacemakers. Ralph Steele is the founder of Life Transition Therapy, a trauma-healing center in Santa Fe, New Mexico. A longtime practitioner in the Theravada tradition, he has been teaching and leading programs since 1987.